Conceptual Research Corporation (CRC) is an aerospace design and research company with a primary focus on the conceptual design of aircraft and spacecraft. CRC can develop a vehicle concept to your requirements, analyze and optimize it, and then bring it to reality through a multi-company partnership. CRC also provides engineering design reviews, methods development, and training in aerospace vehicle design, and markets the RDS-Professional aircraft design software. CRC is led by industry veteran Dr. Daniel P. Raymer, well-known aircraft designer and author of the leading aircraft design textbook. 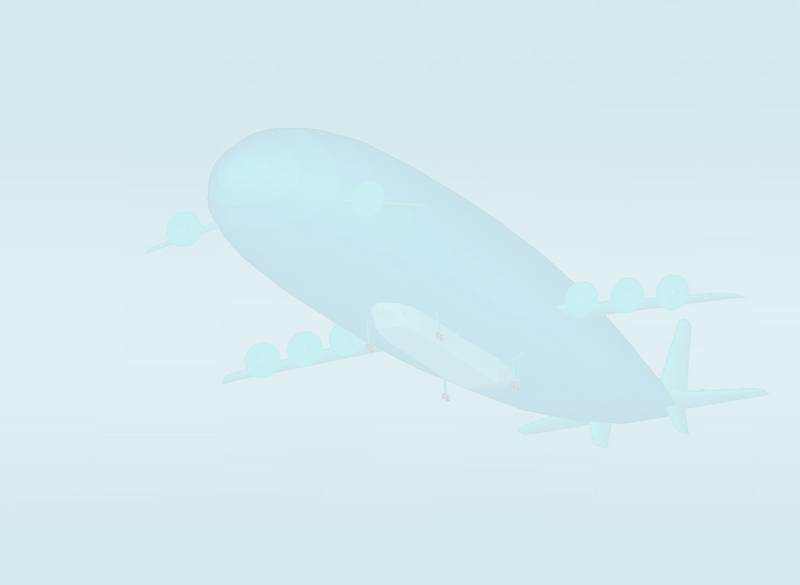 Says Robert Rist, President of Ohio Airship Inc., who hired Conceptual Research Corporation to develop their hybrid airship "Dynalifter" : Dan has been a great asset to our critical design, and helped us determine if we should continue or stop. ...we've continued for 9 years now. We have used his design through many meetings (with investors and government). Not one person argues the facts/physics Dan showed in his studies. He’s a great guy to work with. Conceptual Research Corporation is located and incorporated in the State of California, in the Los Angeles area near LAX. In addition to its own office space, CRC operates as a virtual company using partner subcontract companies and experienced consultants to accomplish the customer's objectives in a timely and innovative fashion. Click here or on the picture for a description of some typical CRC projects. The main business of Conceptual Research Corporation is the conceptual design, analysis, and optimization of aerospace vehicles. These include jet, prop, and rocket-powered concepts, and of all classes of vehicle including military, commercial, general aviation, lighter-than-air, UAV, VTOL, launch vehicles, re-entry vehicles, and others. While innovative design solutions are always considered (we love them - see above! ), CRC also believes that sometimes the best engineering answer is a well-designed "normal" configuration. You the customer will make the final decision as to which design approach best meets your needs. CRC works with the customer to define system requirements, then develops one or more concepts, conducts analysis, performs optimizations, and presents design reports and briefings. 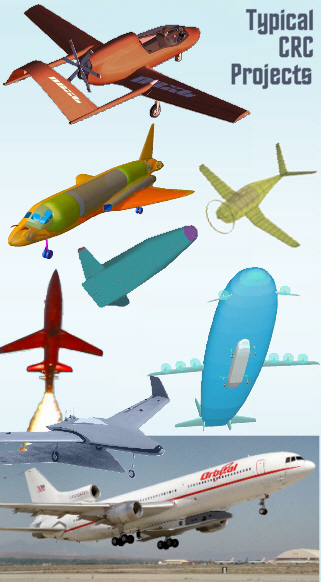 Projects can range from "quick-look" feasibility studies to a substantial effort by a CRC virtual company team including CFD, structural design, FEM, subsystems design, production design, and whatever else it takes to get the design to the desired level of maturity - including flight, if funding is available! CRC can simply do a design study for you and then "walk away." Or, it can become intimately involved in your design effort, interacting with your program management and engineering staff at any desired level ranging from consultation, to an active design involvement, to acting as overall program manager and "doing it all". In this case CRC will bring together and manage an appropriate subcontractor team for the project. Often a person or company will invent a new aerospace technology or concept, but not really know how to assess it or determine its benefits - the essential first step towards obtaining funding and support. In the end, any aerospace technology must "earn its way" on to some future flight vehicle or it isn't worth the time and expense to mature it. CRC can help by reviewing the new idea, assessing it versus existing technologies, and identifying likely applications. Then CRC will design one or more notional vehicle concepts and perform trade studies to determine the benefits of the idea. CRC will also prepare a technology maturation plan to bring the idea to an acceptable Technology Readiness Level. For a better idea of CRC's approach in such studies, see Dr. Raymer's Advice to Inventors. An important part of the aerospace design process is the "Red Team" review, where the entire design is formally presented to a knowledgeable person or team who will ask the hard questions, challenge every assumption, and give the entire project a "good scrubbing." Even if no problems are uncovered, the preparation for an upcoming Red Team will have motivated the design team to a better effort. In the past, the Red Team review was often done by the company's Vice President of Engineering who was selected for that position at least partly on a proven ability to do a good Red Team. Today, VP's need a different skill set to maneuver through the tangled webs of politics and customer relations, so it is sometimes wise to turn to an outsider. CRC provides such Red Team design reviews, giving a confidential outside review of your design concept with focus on risk reduction and design optimization. Usually these are performed on-site by CRC President Dr. Daniel P. Raymer. Other subject experts may be brought in if appropriate. Please note that if a Red Team review is desired for an overseas customer on a military or high-technology project, US State Department approval will probably be required which adds to the expense and can cause a delay while waiting for approval. CRC performs methodology audits to ensure that your design team is using state-of-the art methods and tools in its design activities. Dr. Daniel P. Raymer, President of CRC, has extensive experience in the development and use of advanced design tools including CAD, computational design analysis (CFD, FEM), simulation, and design optimization. Raymer will review your tools, discuss methods with key employees, and construct process flow charts; as-is, and recommended. Following the audit, CRC can help implement any recommendations and can train your staff as well. Recently Dr. Raymer performed a methodology review of a study by Bombardier which sought to determine if its Global 6000 business jet really does have a smoother ride than its closest competitor as claimed by the marketing department. Bombardier had already performed in-flight tests of both aircraft, but wanted outside verification of the fairness and technical accuracy of the comparison. To ensure there would be no bias, Dr. Raymer made sure that he got paid whether the result was favorable or not! For the final answer, see the Bombardier marketing video featuring an interview with Raymer. As described here, CRC's first project was a preliminary design study of a aircraft modification, namely the use of an L-1011 to carry and launch the OSC Pegasus booster. CRC can perform modification studies, preparing conceptual layouts and doing the "before" and "after" analysis to determine the benefits of the proposed change. Typical examples include re-engining, addition of winglets, and aerodynamic cleanup. When appropriate, CRC will bring subcontract companies into the project, and has an excellent ongoing relationship with a number of world-class firms capable of providing CFD, structural design and analysis, production lofting, and other needed skills. While not a normal part of our business, CRC can provide expert witnesses and consultants for legal actions involving aircraft, aviation, and spacecraft. CRC President Dr. Daniel P. Raymer offers a unique combination of broad technical expertice plus presentation skills honed in over 30 years of aviation-related speaches and short course presentations. Dr. Raymer recently served as expert witness/consultant in support of an aircraft design company in a lawsuit against a previous project teammate over an issue of intellectual property. Raymer reviewed all the technical data and wrote position papers which were provided to the Judge and his technical Special Master. Raymer sat next to the lead lawyer during testimony and cross-examination, passing notes with technical questions to ask of the other side's engineers and expert witness (a well-known retired Vice President of a major aerospace firm). At one point the lead lawyer told Raymer, "Thank goodness you've arrived - we knew we had the facts on our side but you've been able to pull the team together by bridging the gap between us lawyers and the engineers with all their technical talk." In the end, the technical judgment validated the positions that Dr. Raymer supported. Send a message to Conceptual Research Corp.